So, I’ve finally got some time on my hands. Not that I needed much to whip up these little lovelies. I’ve stared admiringly at the picture of these in the book and finally got organised enough to make them to go with coffee last night. Well, I thought I’d got myself organised. You see, I’d bought some white chocolate. 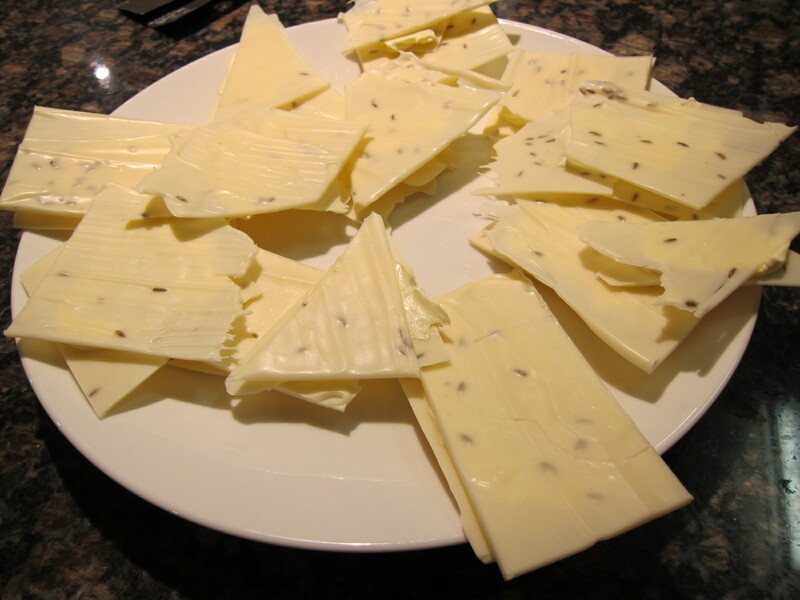 I know that technically white chocolate isn’t chocolate at all, and I hadn’t seen any really GOOD white chocolate that I wanted to use in this recipe, so I bought a few blocks of the Lindt White Chocolate at the supermarket. All good. Except when I went to open it last night and I discovered that in my semi exhausted state I had mistaken milk chocolate for white chocolate… doofus! I was so intent in getting this recipe made and off my list that I bent to the circumstances and made it – but only used the White Chocolate Melts, which aren’t all that great for recipes like this. Because I wasn’t working with premium chocolate I must admit I didn’t go the whole hog and make pretty shapes with the chocolate, but the result was actually pretty reasonable even with the dodgy chocolate used. The upside of using the melts was that the chocolate wasn’t quick to melt after the dessert had been assembled, so that was a bonus. The recipe comes from the amazing Sat Bains. I’ve been watching him on Great British Menu and I love the way he thinks about food. Next time I’m in England, I’m going to try and get to his restaurant in Nottingham. This last trip I managed to get into Heston Blumenthal’s Fat Duck and it was spectacular – everything I hoped for and much, much more. Such fabulous memories, I can’t wait to try my luck and see if I can manage a sitting at his Melbourne Pop Up later this year. Really the recipe couldn’t be easier. Bung in your cumin seed, and the chocolate. Melt it and whiz it around a but, and then scrape it down a bit. 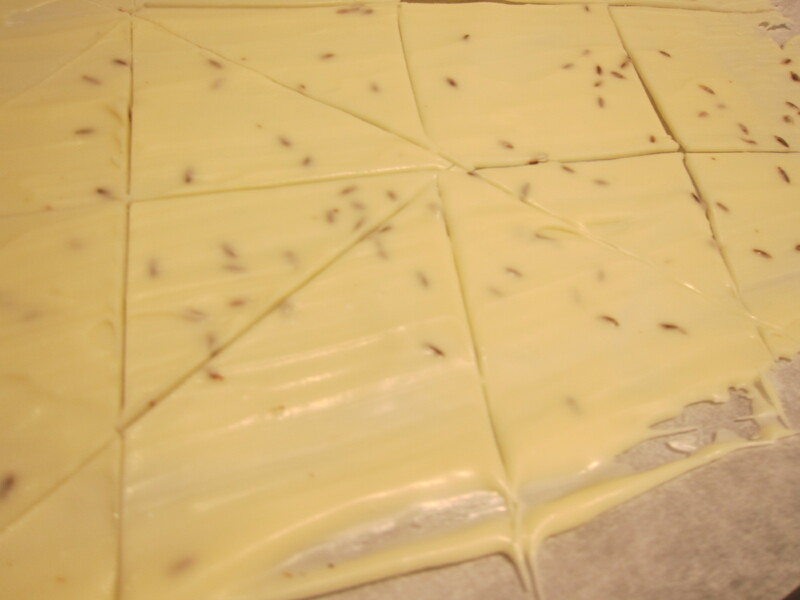 Pour in onto a silicon sheet or baking paper – I used baking paper on a baking sheet. Smooth it out with your spatula – as it cools down it gets easier to put nicer patterns on it. The tricky part comes next – you refrigerate it until it’s just set enough to make an indentation with a cookie cutter that will actually stay – so timing is crucial. I attempted to fridge a few times before I gave up in disgust at my lack of success and then reverted to just leaving it on the bench so I could keep an eye on how set it was becoming. Because I was running out of time and figuring I hadn’t used great chocolate for it, I decided to give the fancy shapes the flick and just ran a knife through it to create some rectangles and a few triangles. Then I refrigerated it to make sure it was set, and because I heeded the warning that it melted rather quickly in the recipe! 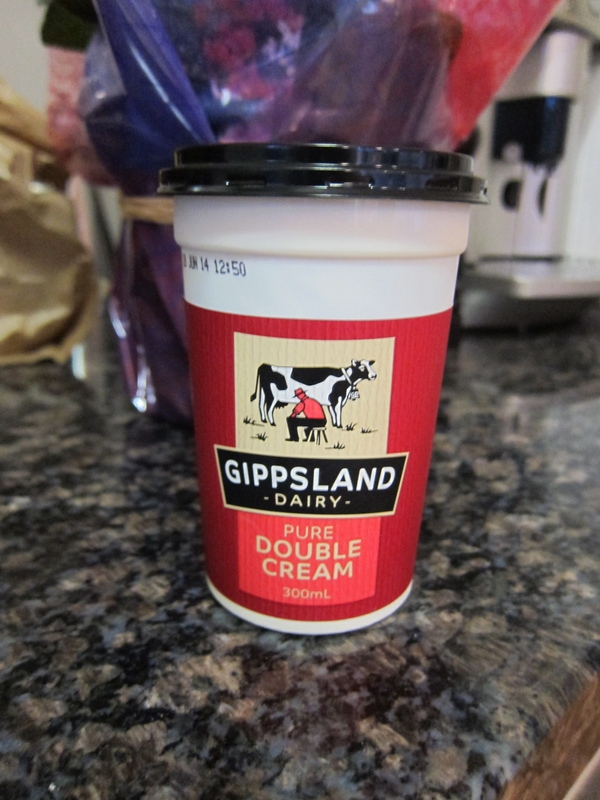 I had some great cream in the fridge – it’s the Gippsland Dairy Double Cream. It’s so thick and luscious I didn’t see the need to whip it – I just used a butter knife and slathered it in between two discs of chocolate and arranged them (very hurriedly) on a plate. Well, these were quite a delightful little treat. Certainly something I’d serve again with coffee. Here’s the thing – I was trying to be good and thought I’d put the merest hint of cream between some of the discs, but I’ve got to say the more cream, the more the flavour of the cumin comes through. So now you have that on my good authority – go for your life!